Character: Clear, slightly pale with fresh aroma & smooth velvety flavor. Delicate jammy notes reminiscent of mild Bordeaux. Since the early days of white tea export (1890's), the process by which it is made has not changed much - the fresh leaf is delivered to the factory on foot, withered, lightly rolled and then dried naturally - no further processing required. 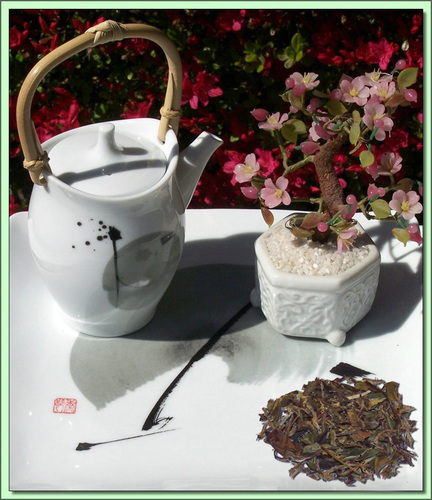 This organic Pai Mu Tan is an excellent example. The leaf is full and ranges in color from pale green to silvery with lots of nice tips. The leaf contrast gives the tea a very natural look and a very pure, natural cup. Rounder and more full-bodied than Silver Tip grade, Pai Mu Tan produces a cup that dazzles with subtle layers of peach and floral notes. Organic tea is produced without the input of chemical fertilizers or pesticides and herbicides. Certified Organic by QMI Organic Inc. Certificate #: 150 - 2008. USDA Certified Organic. Hot Tea: This tea is best enjoyed by pouring 180F/90C water over the leaves (1-2 tsp per cup) for 3 minutes (longer=stronger). Don't remove the leaves. Can be infused repeatedly 2-3 times using higher temperatures & shorter infusions until flavor is exhausted.